This is more to life at CAMBRIDGE than work. Infact students are encouraged to make the most of excellent Social Cultural, Sporting opportunities available. Whatever their interest to their standard it may be, they will soon discover that their are many others with similar interest and abilities. 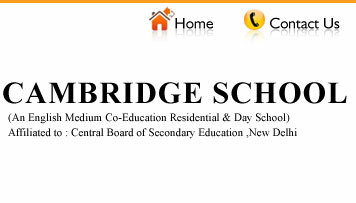 In particular, CAMBRIDGE gives them the chance to try new activities like Judo, Karate, Yoga, RT. Athletics, Debate, Seminar, Symposium, Quiz Competition, Public Speaking, Computer, Extempore and Elocution. Regular game classes are held for which School has qualified P. T. Teachers. Our children are divided into four houses- TAGORE, SHIVAJI, RAMAN and CHANAKYA thereby building a healthy spirit of competition whether it is in the classroom or in its extra curricular activities like Debate, Elocution, Quiz Compitition, Cricket, Football and Badminton tournaments. We caution parents in the areas a child is weak in. Parents are called if required to discuss about the individual problems of the child. Introduction of value education through school diary. We also welcome parents to meet respective teachers and other authorities to discuss about the problems of their children as well as the school. We believe parents are our best well wishers and patrons. The Academy believes in excellence. Admission in the Academy is made purely on merit basis. As seats are limited in each class, students for admission are selected on the basis of Selection Test and Personal Interview. As the academic session of the academy begins from 1st of April, admission formalities are to be completed before 31st of March every year. The printed admission form for admission along with prospectus can be obtained from the school office on payment of Rs.300.00. The same will be mailed on receipt of an account payee bank draft of Rs.350.00 in favour of CAMBRIDGE SCHOOL, Payable at Ranchi. The Boys/Girls selected on the basis of written test will face an interview for the final selection. Municipal Birth Certificate for admission in Nursery and K.G. Original School Leaving Certificate and Progress Card of the Previous School, Counter signed by Education Deptt. of Jharkhand. Character Certificate from the Principal of the previous School. Mark Sheet & Admit Card of the Board for Admission in Class XI. Introduction of a Local Guardian, if any. Caste Certificate in case of S.C. /ST. /O.B.C. A student can be withdrawn from the school at the end of an academic year. If a student is withdrawn during the academic session, only caution money will be refunded. Three months prior notice shall be required if a student is to be withdrawn from the school otherwise fees will be charged for three months. One month tuition will be deposited by the students at the time of taking School Leaving certificate/Transfer certificate.